The Bangor Chamber has been an active part of the region’s business community for more than a century and is well recognized for its many events and business development efforts, representing more than 20 communities in the region and more than 800 members. The site boasts a beautiful, full-width custom design which serves a wide array of information including member news, premier member logo display area, calls to action, social feeds, email newsletter signup, and affiliated program links. The site includes an integration and styling of the ChamberMaster member and event management tool. A featured event and news feed helps promote special events while the “Deb’s Blog” presents news and updates from the Chamber President, Deb Neuman. 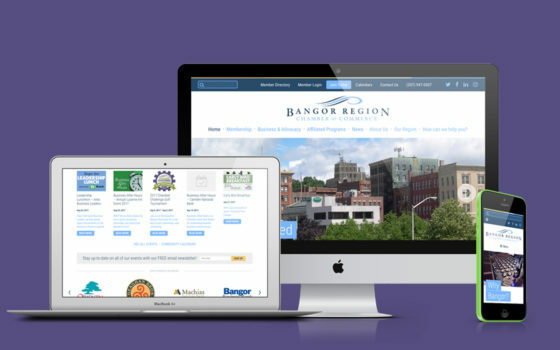 Finally, the site offers the Chamber dedicated spaces for online advertising opportunities and sponsorships for Chamber members, which can be defined on a page-by-page basis.